From cattle reared on an organic diet on farms with high welfare standards. Good Food - Made from succulent organic beef, reared by carefully selected British farmers who work to high standards of quality and animal welfare. Good Farming - Organic farming promotes high animal welfare standards and encourages animals to graze as nature intended. Good Causes - Sales of Waitrose Duchy Organic products provide a donation to The Prince of Wales's Charitable Foundation. This year, over £2.5m will be donated to the Foundation, supporting good causes across the UK. Since 2009, you've helped to raise over £17m for initiatives such as the Duchy Future Farming Programme, which helps farmers develop more sustainable farming practices. Collagen/meat protein ratio under 15%. Percentage of fat content under 10%. 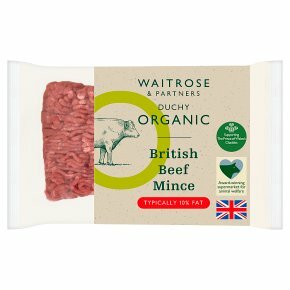 Made from succulent organic beef, reared by carefully selected British farmers who work to high standards of quality and animal welfare. Pan Fry. Time: 24 - 26 mins. Remove all packaging. Place the mince in a frying pan and cook for 4 - 6 minutes until browned. Add choice of sauce or stock, bring to the boil, reduce heat for the remaining time and simmer gently, stirring occasionally until thoroughly cooked. We recommend that all minced beef should be cooked thoroughly until the juices run clear and there is no pink meat.